Fun in the sun is just what you will find at Sunny Daze! This accommodating cottage, just right for smaller family groups looking for a private getaway, sits off the main highway in a nice neighborhood perfect for a bike ride or a morning run. Walking distance from the beach, equipment rentals, and a locally owned ice cream shop, Sunny Daze is right where you want to be. The house is designed to take in natural sunshine to brighten your day. The open living, dining, and kitchen area has cathedral ceilings with lots of windows. A side table in addition to the dining table is a great spot for a friendly game of cards, winner gets to skip cleaning up after dinner! 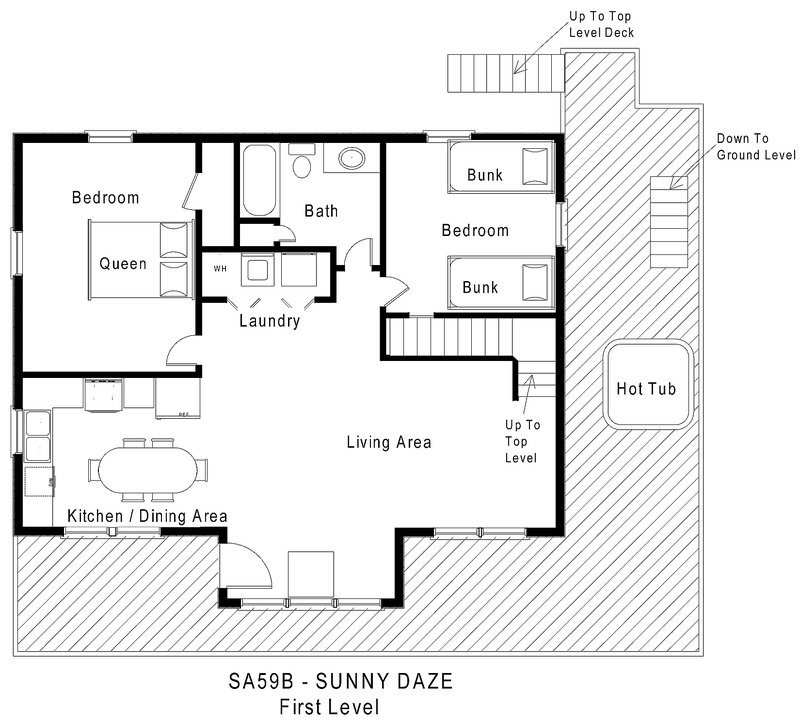 Two bedrooms are on this level. A queen bedroom and a bedroom with 2 bunk bed sets share a full bathroom that opens onto the common area. 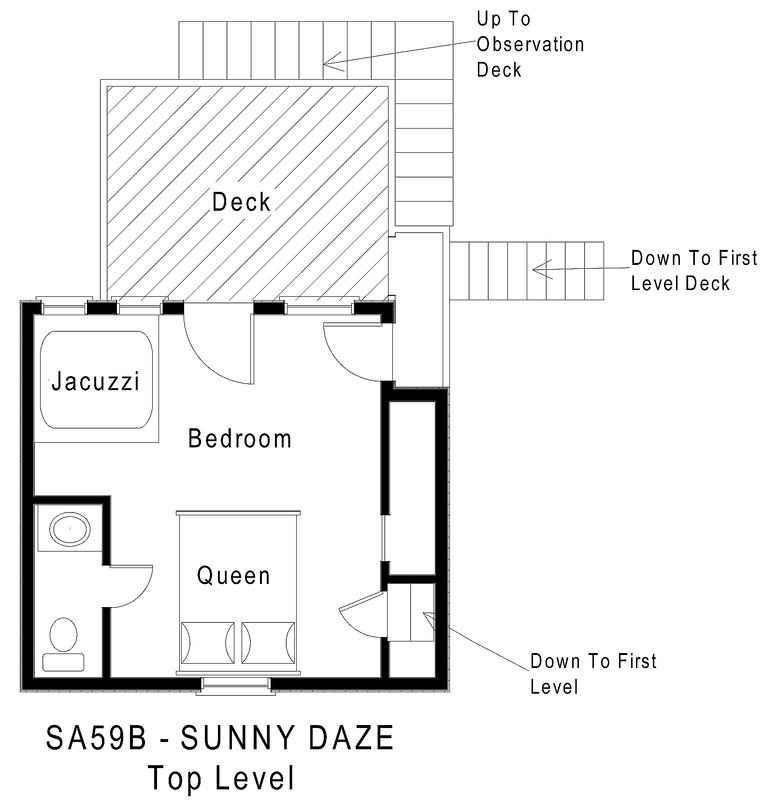 Upstairs is an additional queen bedroom with a private half bath and Jacuzzi tub large enough for a romantic soak for 2. This bedroom opens onto the furnished screened porch. From the roof-top sun deck with ocean-to-sound views to the secluded side deck where the bubbly hot tub is located, you will find no shortage of places to take in the refreshing salt air. Dogs are welcome (sorry, no cats) at Sunny Daze, too, so this is truly a vacation home your whole family will want to return to year after year. Does this unit have a washer/dryer? And possibly an outdoor shower? Yes, washers and dryers are standard amenities provided by all homes unless otherwise stated in the property description. An outdoor shower is provided as well. For the 2018 season, a linens package is not provided for this property. The house is great! Exactly what we expected and met all of our needs! The walk to the beach can be a bit strenuous if taking lots of gear due to crossing the dunes. Home has lots of amenities. We were stuck in a tropical storm but had plenty to do in the house. Good location to Sound. Jacuzzi is wonderful.